BIGGER THAN ANY YOU CAN BUY! ANTWORKS is a trademark of Fascinations Toys and Gifts Inc.
ANT FARM is a registered trademark of Uncle Milton's Industries Inc.
MUTANTS is a trademark of Antimal House Inc.
ANTQUARIUM is a trademark of Globus International Ltd.
ANT CHOW is a trademark of Ant Chow Ltd. The Best Refill Ant Gel Kit! The # 1 Replacement Ant Gel! REFILL YOUR EXISTING ANT HABITAT AND- SAVE MONEY!!! FIND UNUSUAL CONTAINERS AROUND YOUR HOME, SCHOOL AND OFFICE OR DESIGN AND MAKE YOUR OWN! MAKE A GEL ANT HABITAT LARGER THAN ANY YOU CAN BUY IN STORES! OTHER REFILLS MAKE ONLY 1-1/2 CUPS OF GEL (OR LESS) WHICH WON'T REFILL EVEN ONE OF THE LARGER GEL ANT HABITATS. USE ANT CHOW TO CREATE FASCINATING SCIENCE FAIR PROJECTS! IT'S EDUCATIONAL AND FUN TOO! IF YOU HAVE ANY QUESTIONS ABOUT YOUR CUSTOM ANT HABITAT DESIGN PLEASE FEEL FREE TO ASK! WEV'E BUILT A LOT OF THEM OVER THE YEARS IN ALL SHAPES AND SIZES AND ARE MORE THAN HAPPY TO SHARE OUR KNOWLEDGE! 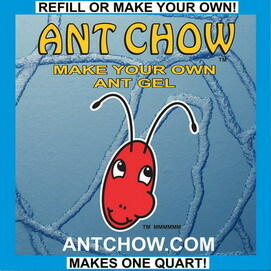 Ant Chow Refill Gel Kit Ant Chow Refill Gel Kit Product description: Ant Chow refills any brand gel ant farm or you make a custom ant habitat of your own design! The number one replacement gel!